Playa del Rey, California (Tuesday, July 28, 2015) – On a sunny Saturday in coastal Los Angeles County’s Ballona Wetlands, flurries of tiny, blue butterflies were out and about dazzling observers with their courtship displays. 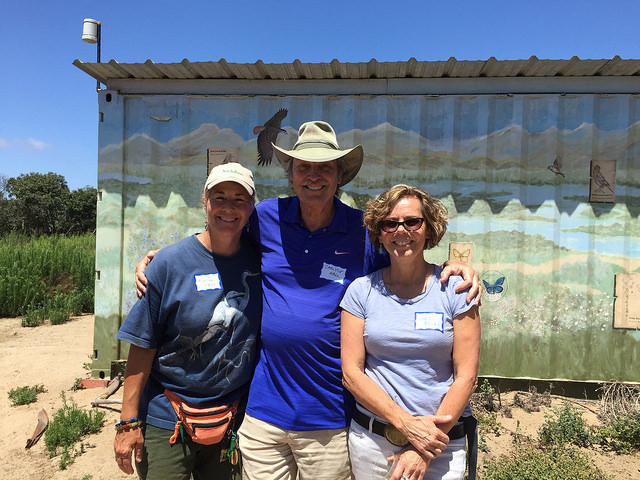 Local nonprofit environmental organization Friends of Ballona Wetlands (Friends) facilitated this opportunity by hosting some of their constituents at the “We’ve Got the Blues” event celebrating the comeback of the El Segundo Blue butterflies (“Blues”). These insects, usually less than 1-inch across with their wings open, thrive in their blooming coastal buckwheat habitat – the coastal buckwheat is their only host plant. However, the Ballona Wetlands population of Blues wasn’t always this abundant and active; they are a federally listed endangered species that, until recently, were thought to have been extirpated from the area. In 2011, Daniel S. Cooper, an environmental consultant who regularly monitors birds and other wildlife, discovered a small population of Blues in the wetland dunes. The population subsequently exploded from thirty residents to, four years later, hundreds of Blues in the area. The Friends invited Dr. Irena Mendez, a natural resources consultant for Psomas, who monitors this Blues population, to share her wealth of knowledge about the extraordinary butterflies. 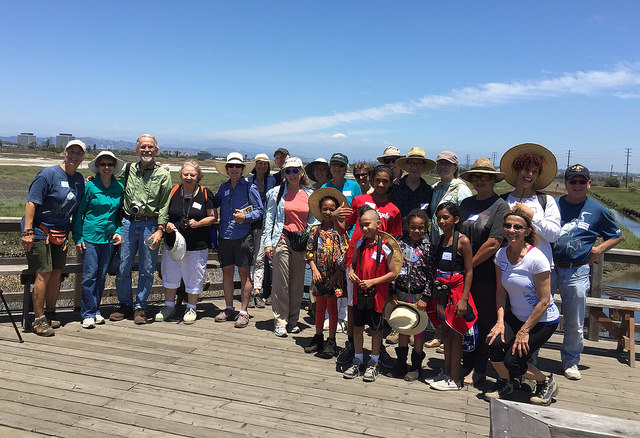 As participants at the afternoon outing enjoyed refreshments and guided tours of the coastal buckwheat habitat, Mendez explained that the population of butterflies had more than doubled since her last survey in 2013. At the same time, there is still more research that needs to be done to study the butterflies to plan for their long-term survival. Dr. Eric Strauss, Executive Director of the Friends’ partner organization, the Center for Urban Resilience at Loyola Marymount University, informed the group that, “The butterflies are a hyper-local species; you only find them here. Moving forward, we will have to carefully monitor the population because genetic diversity allows us to predict the long-term stability.” He also reinforced the criticality of preserving the coastal buckwheat habitat. 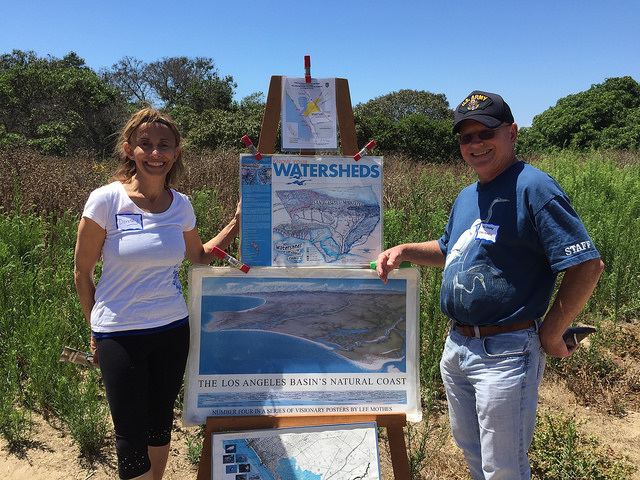 For more information about the event, please see the Friends of Ballona Wetlands press release and the event photos. About the Author: Laurel Hunt is the Director of Strategic Partnerships at CURes. She has a master’s degree in Urban and Regional Planning from the University of California, Los Angeles. The emphasis of her graduate studies was on climate change adaptation, regional environmental sustainability and community-based participatory planning. At UCLA, she served as the Director of the Sustainable Resource Center and founder of the campus’ first-ever sustainability film festival, Green Screens. She brings to her role as Director of Strategic Partnerships at CURes experience working for Los Angeles environmental nonprofit organizations as well as for the U.S. House of Representatives’ Select Committee on Energy Independence and Global Warming and the Center for American Progress, a Washington D.C. policy and advocacy organization. Currently, Laurel leads the Mediterranean City Climate Change Consortium (MC-4), a global climate action network of practitioners, policymakers, business leaders and academics. She is also the Managing Editor of Cities and the Environment (CATE) Journal, a peer-reviewed online scholarly publication dedicated to the study of urban ecology. CATE is jointly supported by CURes and the U.S. Forest Service.